There is an unbelievable number of military-history monuments on each continent. Even more of them survived on beautiful designs, paintings and engravings which are kept in archives and museums. However, not only experts and admirers like the well maintained walls, green moat areas, interesting constructive details and magic sites of underground forts. Fort Josefov offers a lot of those to visitors. 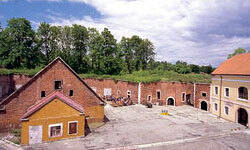 Fort Josefov, formerly Ples, was built between 1780 and 1787 as the protection of Eastern Bohemia against the danger of Prussians. Its location, about 20 km away from the country confines, reflected then military strategy to defend the country through a strong field army with a few big forts in the rear. In Bohemia, these were Hradec Králové (Königgrätz), Terezín (Theresienstadt) and Prague, of course, and Olomouc (Olmütz) in Moravia. 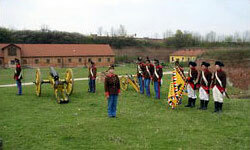 The Fort Josefov defense system then corresponded to the period military tactics and army equipment. Up to 12.000 men were supposed to defend it. 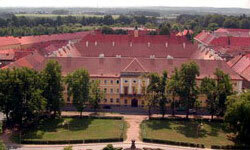 Fort Josefov was built according to Duhamel de Querlonde´s design, the French engineer in Habsburg service, who jointed both his teachers fortification experience and the given terrain advantage. The fort’s core was situated on the hillock above the Elbe and Metuje rivers confluence. Their barbican was shielded by the so called crown wall. 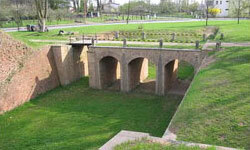 It was possible to dam up the river streams and to flood the adjacent fort’s neighborhood. There were four gates to enter the fort. 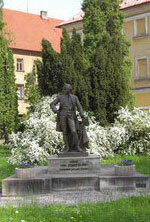 The name Josefov (Josefstadt) reminds us of the Emperor Joseph II, the founder of the fortified town. The bastion forts reached their development climax in the 18th century and the French fortification civil-engineering was well known around Europe. Josefov is its significant part. And at the same time, it is one of its final-phase constructions – a town founded on the virgin ground. Fort Josefov was ready to defend several times in its history but nor the Napoleon wars nor the 1866 Prussian-Austrian War did not bring it a fame. The military strategists of the 19th century followed different rules than their predecessors. Josefov was never involved in a real battle. In 1888, its fortress status was removed and the town was getting rid of the walls. Henceforward it remained the typical garrison town. 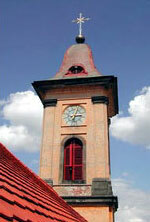 It merged with neighboring Jaroměř in 1948. Also, Josefov is remarkable through its inner setting. All the buildings were constructed according to the unified architecture and they form the unique urbanistic complex. Therefore, in 1971 it was proclaimed the Urban Preserve. The best way how to acquaint oneself with the defense system is the visit of the underground corridors. 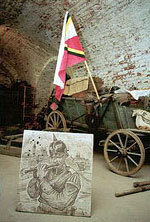 The town history is documented on the City Museum display in former Josefov town-hall. 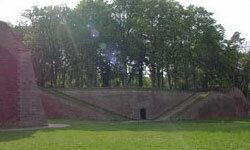 The fortification architecture was linked with the improvement of shooting arms especially artillery. 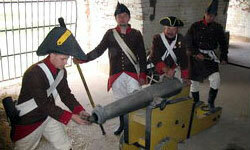 The military history is a continuous competition of the aggressor’s arms efficiency and the forts defensibility. The walls resistance, however, was not a sole victory condition; the active resistance of defenders was another one. The construction and shape of each wall elements were subordinated to above mentioned conditions. The bastions, pre-bastions, courtines, ravellines, covered roads, gathering spots and tens of others were the most important ones. 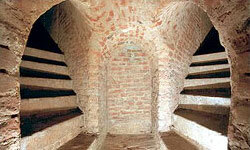 The military engineers used them as the brick-box to compose the sophisticated complexes. One wall element was designed to protect another one and facilitate the easy shooting actions of defenders at the same time. The leading artists and architects were involved in the building process. The plain soil, stones and bricks above all were the common materials reaching the tens of millions of pieces. The soldiers and thousands of various profession-workers took part in the construction. There were several complementary ways how to fight a fort. If the surprising attack failed the long-lasting and exhausting siege was next. 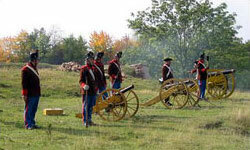 The artillery played the decisive role – on both sides of course. The wicker-work baskets filled with soil protected the artillery emplacement. 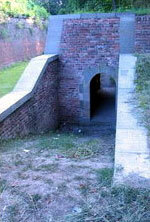 Those inside the fort were situated on the wall tops, or behind the casemate gun-ports. One can see such gun-ports on several places beyond the Novoměstská Gate. Also, the infantry had its assigned tasks. They were positioned on the covered road protected by the so called breastwork. Now-a-days, the favorite footways follow its rims. The infantry drove against the enemies, too, destroying the battering-train and fighting head-to-head. The enemy sappers were digging trenches called “saps” since the very first day in order to provide the access as far as the fort. They were followed by miners who attempted to break the wall down with gun-powder explosions in order to let the infantry enter and capture the fort. The modern forts were provided with a permanent anti-mines system. The sophisticated net of underground corridors was to prevent the intruders from underground activity. The defenders could fire their own mines and stop them. The underground works and fighting were the most risky specializations of the war trade. The miners´ profession required special skills but was considered unfair. The miners were building Josefov Fort underground, too. The underground fort protection consisted of the mine branch lines: the outer one about 150 m distant from the wall moat, and the inner one formed into two floors. The mine branch itself consisted of several small low corridors were the gun powder blast was loaded. The explosion then aimed the ground surface. Such a small corridor called “stove” or “chamber” could be used several times. The shooting gallery entwined the entire fort along the outer wall. If the enemy had struggled through the moat he could have been threatened from gallery firing. Josefov fort underground is a unique technical monuments also thanks to the air-conditioning chimneys and drains. 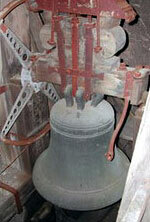 It was the largest one in Europe in the 18th century. There were about 45 km of all the corridors and mine branches. Other kilometers belong to the unique water drain system, still functioning. Underground casemates are hidden inside the wall ramparts. It is where the soldiers lived during the war, and where the storage or gun-ports were situated. Today, one of the casemates of Bastion N.1 hosts the M. B. Braun´s baroque lapidary collection – the part of the underground section. There is a town history displayed inside the former Josefov town-hall. The monarchy days revoke the Military History Club shows.